Sulfuric Acid Poisoning is the accidental or intentional intake of any product containing the compound. The exposure may be through skin or eye contact or following an ingestion of the chemical. What is Sulfuric Acid Poisoning? Sulfuric acid is used in the manufacture of fertilizers, cleaning fluids, dyes and resins, plastics, industrial catalysts, etc. What are the Causes of Sulfuric Acid Poisoning? What are the Signs and Symptoms of Sulfuric Acid Poisoning? How is First Aid administered for Sulfuric Acid Poisoning? Who should administer First Aid for Sulfuric Acid Poisoning? 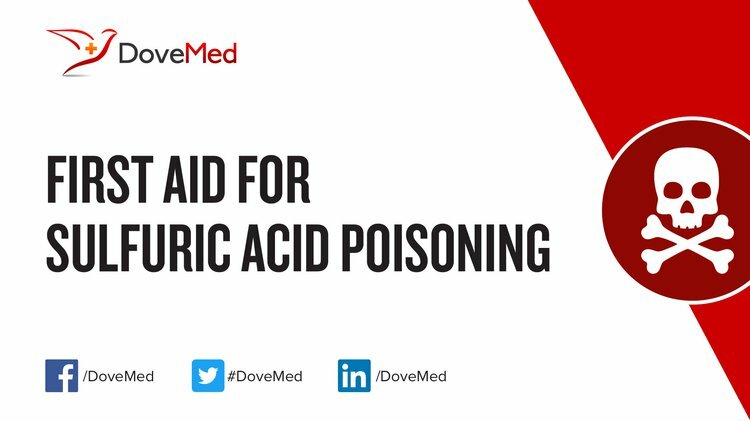 First aid for Sulfuric Acid Poisoning is administered by healthcare professionals. What is the Prognosis of Sulfuric Acid Poisoning? How can Sulfuric Acid Poisoning be Prevented? Park, J. Y., Wang, Z. M., Kim, D. K., & Lee, J. S. (2010). Effects of water on the esterification of free fatty acids by acid catalysts. Renewable Energy, 35(3), 614-618. Li, W., Zhang, Y., Liu, T., Huang, J., & Wang, Y. (2013). Comparison of ion exchange and solvent extraction in recovering vanadium from sulfuric acid leach solutions of stone coal. Hydrometallurgy, 131, 1-7. Ji, X., Lee, K. T., Holden, R., Zhang, L., Zhang, J., Botton, G. A., ... & Nazar, L. F. (2010). Nanocrystalline intermetallics on mesoporous carbon for direct formic acid fuel cell anodes. Nature chemistry, 2(4), 286-293. Liu, J., Wang, J., Qi, J., Li, X., Chen, Y., Wang, C., & Wu, Y. (2012). Heavy metal contamination in arable soils and vegetables around a sulfuric acid factory, China. CLEAN–Soil, Air, Water, 40(7), 766-772. Karagiannakis, G., Agrafiotis, C. C., Zygogianni, A., Pagkoura, C., & Konstandopoulos, A. G. (2011). Hydrogen production via sulfur-based thermochemical cycles: Part 1: Synthesis and evaluation of metal oxide-based candidate catalyst powders for the sulfuric acid decomposition step. international journal of hydrogen energy, 36(4), 2831-2844. Arnold, F., Pirjola, L., Rönkkö, T., Reichl, U., Schlager, H., Lahde, T., ... & Keskinen, J. (2012). First online measurements of sulfuric acid gas in modern heavy-duty diesel engine exhaust: implications for nanoparticle formation. Environmental science & technology, 46(20), 11227-11234. Kodama, K., Shinohara, A., Hasegawa, N., Shinozaki, K., Jinnouchi, R., Suzuki, T., ... & Morimoto, Y. (2014). Catalyst poisoning property of sulfonimide acid ionomer on Pt (111) surface. Journal of The Electrochemical Society, 161(5), F649-F652.